After a harrowing night spent shivering deep within Leedshire Forest, the party awoke to find themselves all at level three. Oh yeah, and Boots was there, too. Grabby went with the Arcane Trickster path, presumably to cause mischief more than anything else. Ander went with the Hunter path, taking the Colossus Slayer feature which should come in handy should one of his arrow's actually find its mark. He can also cast heal light wounds now, so that should help everyone out quite a bit. Audrey took the Berserker path because, well, she's a barbarian. She also realized that when she rages she gets significant damage reduction, that could have helped earlier. Broak decided on the Battle Master path, granting him access to maneuvers, which I'm curious to see in action. Finally, Boots took the Pact of the Chain path, selecting an imp (of course) as his chosen fiendish familiar. After traveling another day, the party reached Leedshire and returned to Albrecht's estate. They dropped off some of their gear and were beckoned by a guard to report to Albrecht. Going into the manor they passed by a familiar guard named Willem (a guard friendly to the party) who was standing outside of Albrecht's study. Upon entering the weary party was greeted by Albrecht who was anxious to discover if they were successful in their task or not. Audrey pulled out the Forge Hammer much to Albrecht's delight, which he greedily took from her and carefully studied it. 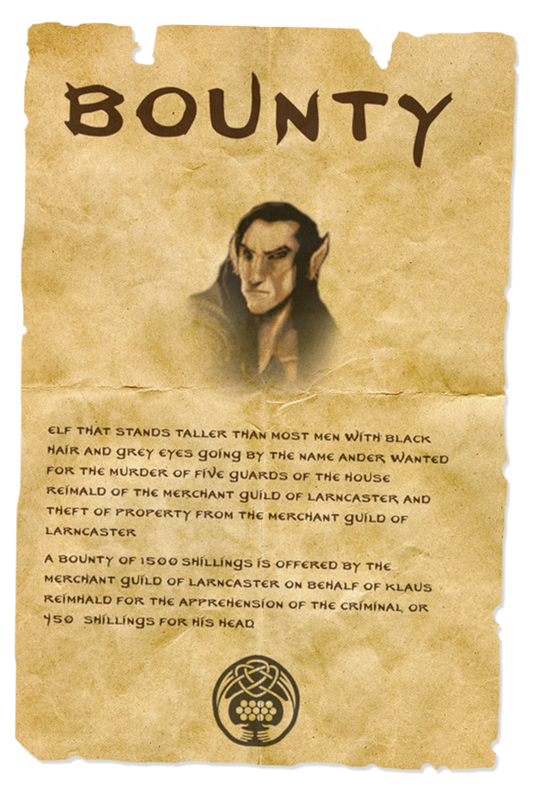 He quickly composed himself and handed the relic off to Gotri, his dwarf bodyguard who was standing nearby, to place it in a secure location somewhere in the manor. Quickly dispensing with pleasantries, the got right down to business: payment. True to his word, Albrecht puled out a formal looking piece of parchment, signed it, scribbled down a note, folded the two papers together and put his wax seal on them and passed them off to the party as well as the keys to the manor. They were now the custodians of a manor on the outskirts of the village of West Leedshire, about a three hour march outside of Leedshire. In addition, they were given a horse, cart and a cask of ale to celebrate with to carry them to their new base of operations. It would seem Ander's past had caught up with him. Surprisingly, Albrecht seemed unconcerned by this turn of events, and simply warned Ander that Willem had found the bounty posted early in the morning in Mercenary Square, which he quickly brought to Albrecht. 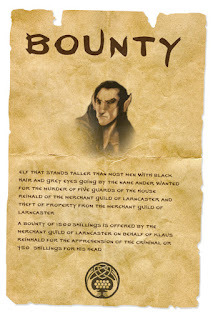 Knowing that the bounty was most likely posted at all of the gatehouses leading out of town (Ander did notice a gate guard staring at him when they had returned earlier) it may be difficult for him to leave town. Returning to his friends, he found them packing up their belongings in their new cart and Ander informed them of his situation. They decided to leave that night under cover of dark knowing that the gates would only be lightly guarded—but more suspicious of travelers. Both Ander and Boots covered themselves in gear in the cart (Boots didn't want to be mistaken for Ander) and they headed out the town's west gate. They managed to roll through without incidnet, and Audrey and Grabby enjoyed the cask of ale as they traveled down the road. After a few hours of travel they past through the village of Elmshire and onto West Leedshire. After traveling for about an hour to the outskirts of West Leedshire they found their small manor near midnight where they rested for the night. They woke early in the morning (Grabby and Audrey a little later due to their road ales) and were greeted by Petterlen at their door, the former custodian who lived in nearby West Leedshire. The old man took the papers from them and looked them over. Satisfied, he showed them around manor and the small plot of land and offered his assistance with any matters that might come up. With that he wished them well and headed back to his village. Needing to replenish their gear, as well as make some repairs, the party left for West Leedshire to trade and purchase goods. Once there they split up and went about their business of purchasing gear, repairing armour (from Broak's run-in with some grey ooze), cashing in on some art items, and food for their larder. Boots found the supplies he needed to cast his find familiar ritual and quickly rushed back home before the rest of the party. Back at the manor Boots descended into the cellar and locked himself in the second room. There, he he added the components he needed into a brazz brazier, lit some candles and cast the ritual. Soon the contents of the brazier becan to smoke and burn. They began to coalesce into a black mass of tissue and bone and smelled of burnt flesh and sulfur. 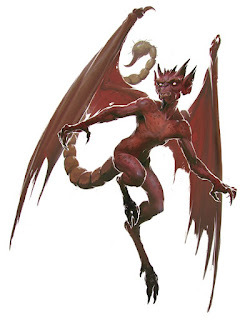 It bubbled and smoked and suddenly two leathery bat-like wings snapped out from the mass, and the small creature stood to its feet, ready to serve its master. Calling itself Yattering, the demonic imp showed its willingness (if somewhat reluctantly) to serve its new master. Upstairs Boots heard his allies coming home, and he immediately dismissed the imp... for now.